Here’s something a little different for all you TpT sellers out there! Enjoy this funny, yet perfect Valentine Card for your special someone. 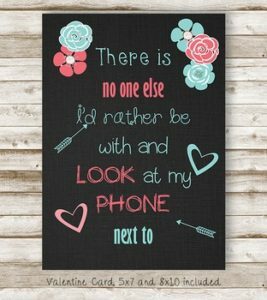 If you truly enjoy sitting side by side and scrolling through your phone, then this card will be perfect! These designs are copyrighted by Barnett’s School House, you may not resell, redistribute or share these templates in whole for any reason. Feel free to contact me if you have any questions!! As always, please ask any and all questions prior to purchasing!